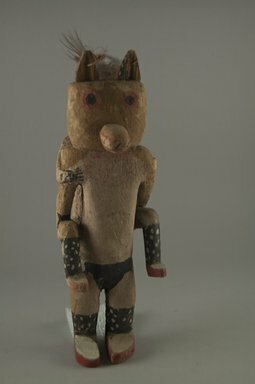 Kachina doll consisting of two figures, the smallest of which is carried piggy-back style. Each figure has wolf-like ears with feathers and a protruding red nose. Each is predominantly ochre and dust-colored except for black shins and red feet. Condition: the standing figure has a repaired nose and right foot, and the carried figure has a replaced left ear. Pigments on both figures are abraded.